Roasted shallot spread, pancetta, and thyme. 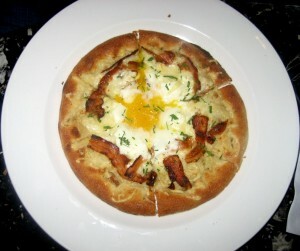 We’ve never seen a pizza with egg on it, so we had to try this out! We didn’t know how the egg would be prepared, but were surprised that it was raw egg-yolk poured onto the center of the pie. This breakfast-style pizza also includes pancetta, a delicious Italian bacon. Overall, this pizza left us unsatisfied. The crust was a bit dense and dry, the bacon was sparse, and it just wasn’t a well-made pizza. Adding egg to an already sub-standard pizza won’t do miracles. Next time, we’re going to try the smoked chicken pizza. 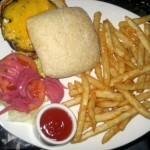 Certified Angus beef served on a toasted ciabatta roll and choice of provolone, gorgonzola or cheddar cheese. We ordered the burger cooked medium-well and opted for cheddar cheese. Wow, this is one the best burgers we’ve had in a while! The patty is savory, thick and juicy and will leave you wanting more. A couple of bites were inconsistently over-salty, but it didn’t take away from the flavor. The ciabiatta bread was soft and moist and did not overpower the burger. One annoyance is that the bread was significantly larger than the patty (why couldn’t they make the burger the same size as the bread!). If you thought it couldn’t get any better, wait until you try out the batter-dipped french fries – addictively yummy! We were surprised when we got it since the happy hour menu made no mention of it. All of this for $5 will be tough to beat! We dined at Joe DiMaggio’s for happy hour on a weekday evening. When we entered the nearly-empty restaurant, there was a host and hostess watching us but made no move towards us or to greet us. After walking around aimlessly for a minute, we asked another hostess regarding happy hour and she said it was self-seating. We sat and our efficient waitress brought our waters and took our orders. Our food came out in a timely manner and she did come by to check up on us a couple of times for refills and to take additional orders. Before leaving, I asked for a happy hour menu to take home but she said they did not have any. But then she discretely removed the insert from the restaurant menu for me to take. It appears there are some unpleasant staff here, but luckily we got a personable waitress who did a great job and earned more points for this category. Joe DiMaggio’s is located in The Domain shopping center and fits right in with the other upscale boutiques and restaurants. The dark wood floors and paneling and high-black leather booths give this place a classy, fine steakhouse feel. Black and white pictures of Joe D., Marilyn Monroe, and others from that era grace the walls. The bar area is huge with plenty of seating for those after-work happy hours or late night drinks. There is also a mini-stage with a piano, where jazz musicians play on certain nights. There is a lounge area adjacent to the bar, with velvety-red sofas where you and your party can relax. The main dining area kicks it up a notch with a warm and romantic feel, perfect for those intimate dinners. Last but not least, there is a large patio with a fire-pit to keep you nice and toasty on cold evenings. Limited parking is available around the restaurant, but there is also a free garage. Whether you are looking for a great happy hour place, an intimate dinner, or a gathering with a group, Joe DiMaggio’s offers something for everything. Joe DiMaggio’s unexpectedly closed its doors last month probably due to financial reasons. This is the first restaurant casualty of the Domain and hope it is the last! Joe D’s happy hour will sorely by missed!